Evelina Cooper, niece of the consulting detective Sherlock Holmes, is a guest of Lord Bancroft, former ambassador to Austria. His daughter Imogen Roth befriended her in school, and after their studies were finished Imogen brought her to London for the Season. With her circus performer background and magical abilities, Evelina has no hope of being presented to the Queen, but does wish to gain entrance to college, where she could continue pursuing her interest in science. Getting to hang around with Tobias, Imogen’s older brother, certainly isn’t a hardship. Just before the start of the Season, everything’s thrown into a muddle. One of the Roth’s maids turns up murdered in the cloakroom, a set of trunks containing some creepy automatons go missing, and a carefully hidden feud between Lord Bancroft and Jasper Keating, the steam baron known as the Gold King, ramps up in intensity. To make things even more complicated, Evelina’s childhood sweetheart and fellow magic practitioner Nick drops into her bedroom, and then he keeps popping up at the worst possible times. 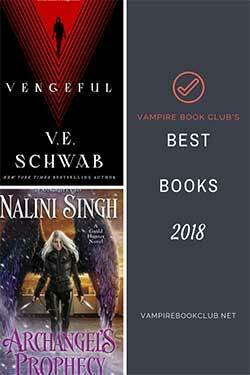 In an Empire where magic is banned and people of the Blood are put on trial and summarily executed, the connection Nick and Evie share will undoubtedly get them both killed. The biggest problem with A Study in Silks stems from its multiple points of view. Not only do we get Evelina’s, but also we have Tobias, Nick, Lord Bancroft, Imogen, and Keating. While not chaotic, it does mean that the main thread of the story, that of Evelina’s investigation into the murder, gets broken into little bits and never really picks up speed. We’re pulled out of the investigation just as she finds her first lead to spend some time with Keating and the steam barons, and it serves no purpose other than to tell us what those nefarious creatures are up to. It’s the same for the points of view of Imogen and Lord Bancroft; their sole purpose is to provide us with information that really only detracts and slows the pace of the story, and, frankly, could have been worked into the story in other ways. I found I had to work pretty damn hard at times to keep up with Evelina’s investigation. The farther I got into the book, the more the switches in point of view irked me. 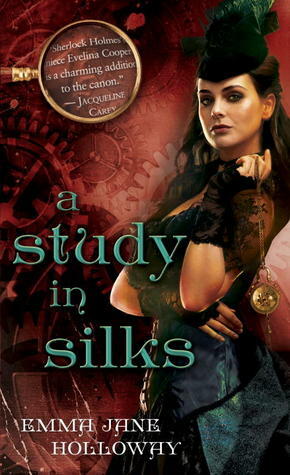 But I still think A Study in Silks is worth reading. Why? Because this book made me cry. That’s a very hard thing to do, but it succeeded a few times. Evelina is a great character. She’s excited to be included in the pageantry of the Season and looking forward to possibly meeting a man she might call husband some day. She likes pretty gowns and staunchly follows all the rules of propriety, yet loves mechanics and science and inventing things. Her steadfast belief that neither Tobias nor Nick is the man for her (and her logical reasons for putting them both off) means that the love triangle isn’t as aggravating as it could have been. She’s quite attracted to Tobias but doesn’t trust him. And as well she shouldn’t with his rakish reputation. For his part, Tobias is confused by what he feels for Evelina. His wandering eye doesn’t stop wandering, but he knows she deserves better…and sometimes, he wants to be that better man for her. Now for the crying part. The feelings both men have for Evelina, and she for them, mean that the triangle isn’t simply, oh, I love him, but I love him, too. Evelina knows Tobias would never be allowed to marry her. She has no wealth, no status, nothing but her looks and her clever mind and a well-known uncle. When it comes to Nick, though, she doesn’t try to deny her love for him. They desperately want to be together, but the magic they both carry in their blood can’t be controlled when they’re together, drawing unwanted attention that would only lead to death. Nick clearly doesn’t care and would sell his soul if it meant he was with her, and Evelina knows that she’ll never love anyone with the passion she loves Nick – not even Tobias. That she’s willing to sacrifice the chance at the love of a lifetime is kind of heartbreaking. I hope the narrative problems are ironed out in the next book in the Baskerville Affairs series. It detracts from what’s otherwise an entertaining and moving read. I really liked this one! When I was finished I immediately wanted to pick up A Study in Darkness! Good Review! 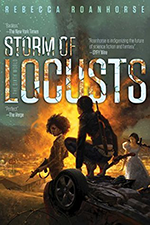 I’ll be reading the next one, but mostly because I need to find out what happens between Evelina and Nick.